Sales of infant products are surging thanks to a baby boom meant to capitalize on folklore about the Year of the Golden Pig. 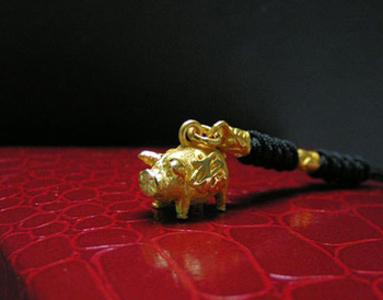 The Year of the Golden Pig comes every 60 years and is believed to guarantee wealth and prosperity to children born during that year. According to distribution industry insiders on Sunday, sales of infant products have soared 30 percent this year over the previous year. Sales of infant products at the main branch of Shinsegae Department Store grew 33.8 percent by mid-April from the same period year earlier. In Lotte Mart, sales of baby formula and disposable diapers jumped 10-13 percent in the first quarter of the year, while baby clothing sales soared a whopping 141 percent during the same period. Sales of infant products have climbed at online shops, too. Infant product sales grew 33 percent at Lotte.com in the first quarter of the year with more than 5,000 sets of infant products selling a month. Shinsegae Mall saw a 40-percent surge in sales of infant products quarter-on-quarter. Sales of imported baby strollers from brands like Maclaren and Queeny increased more than 30 percent this year from the previous year.